Chemistry sets just aren’t what they used to be. The days of stinks in sinks and bangs in basements are well and truly gone, but are certainly not forgotten. Just take a look at the biographies of distinguished chemists: more often than not, their fond memories of childhood are strewn with broken glass, tinted with spectacular colours and reek of sulfurous smells. But in these safety-conscious and litigious times, this is far from easy. ’There are "chemistry sets" on sale today that simply don’t contain any chemicals,’ says Rosanne DiVernieri, Collections Coordinator at the Chemical Heritage Foundation in Philadelphia, US and curator of an ongoing exhibition on chemistry sets. There is just no comparison between modern sets and those from the 1940s and 1950s - the heyday of the chemistry set. ’Back then, children were experimenting with everything they could get their hands on, they were given free rein of their garages and basements and occasionally blew them up,’ she says. So popular was the chemistry set during this period set, that manufacturers frequently boasted there was one in ’every house on every street in America’. The origin of this quintessentially 20th century phenomenon can be traced back to the chemical chest, a beautifully crafted and exorbitantly expensive piece of portable kit manufactured from the early 18th century onwards. At first, these chests, which held everything from complex glassware and ceramic vessels to pre-packaged chemical preparations and reagents, were aimed at a serious and seriously niche market: as one early manufacturer put it in 1730, ’to facilitate and promote the Practice of Chemistry by putting a commodious Laboratory into the hands of Gentlemen’. But new markets soon emerged, with mineralogists, metallurgists and medical students all standing to benefit from this mobile, must-have laboratory. And as the price for a portable chest began to tumble, a new and impressionable kind of consumer stepped forward and dug a youthful hand into its pocket. The first chemistry sets targeted exclusively at children appeared in the 1830s, says Salim Al-Gailani, a graduate historian of science at Cambridge University, UK. ’As soon as chemical manufacturers began marketing towards children they had to invent ways to make chemicals more appealing.’ A good way to do this was to draw on the Victorian obsession with magic, he says. Chemistry and conjuring were so closely bound up that an 1881 copy of Boy’s Own Paper went so far as to suggest that ’most so-called magical illusions are chemistry experiments,’ says Al-Gailani. With children desperate to make their own fireworks, experiment with disappearing inks and perform colour-changing tricks, publishers began to cash in. Towards the end of the century, a rash of handbooks, manuals and penny pamphlets appeared that taught children ’chemical magic’ of the sort taking place in the music halls around Britain, he says. But the outbreak of the First World War took its toll on this kind of recreational chemistry, particularly in Europe. This might explain how two American companies - Porter Chemcraft and A C Gilbert - came to dominate the story of the chemistry set from around 1920 right up until 1960. Indeed, if you owned a set in this period, there’s a very good chance it was made by one or other of these manufacturers, says John Tyler, a retired science teacher, keen collector of chemistry sets and author of The Chemcraft Story: The Legacy of Harold Porter. Both companies employed sophisticated marketing techniques to push their products on children and parents alike. 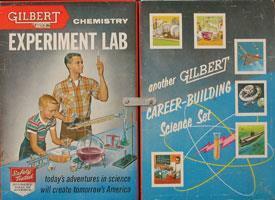 ’Experimenter today, scientist tomorrow,’ promised Porter Chemcraft right up to the 1950s, when its slogan became even more aspirational: ’Porter Science prepares young America for world leadership.’ This shift is reflected in the images used on the boxes. 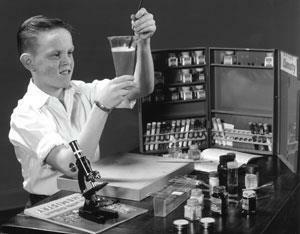 Early on, most sets showed a stereotypical laboratory scene, often with a boy holding up a test tube. By the late 1950s, however, this domestic setting had been replaced by distant horizons, rocket ships and nuclear symbols. Harold Porter set up clubs for the owners of Porter Chemcraft sets, giving members fancy certificates, sending out monthly newsletters and publishing experiments the children had designed, says Tyler. ’It was clever stuff.’ Alfred Carlton Gilbert, who became known as ’the man who saved Christmas’, also encouraged children to undertake their own experiments and in 1937 launched a $100 prize for the ’boy chemist of the year’. This focus on boys is pretty typical of the early sets, says DiVernieri. ’They were almost exclusively aimed at young boys in an effort to get them interested in science,’ she says. Girls did eventually get their own dedicated sets in the late 1960s and early 1970s. But with pink packaging and contents that nudged girls towards careers as lab technicians rather than scientists, they were clearly products of their time. As science began to contend with the sinister side of its image, chemistry sets fell from grace. ’A greater focus on safety and the emergence of environmental and anti-nuclear movements in the 1960s, caused people to question whether free-range science should be marketed towards children,’ says DiVernieri. DiVernieri is more upbeat. ’We’re going to see a resurgence of the kind of sets produced in the 1950s,’ she predicts. ’With the rise of home-schooling and the emergence of alternative schools, particularly in the US, more and more people will demand sets that can be used at home, but that don’t [disadvantage] their children when it comes to science education.’ If chemistry sets are about to reinvent themselves for the 21st century, they will almost certainly be coupled up with some kind of web-based interactive element, she suggests. Let’s hope she’s right.